The Renault FT AC is a French tier 2 tank destroyer. Mientras la vasta flota de Renault FT del Ejército Francés se iban quedando obsoletos tras la I Guerra Mundial, se realizaron algunos esfuerzos para mejorar los vehículos. Una propuesta quería convertirlos en cazacarros, pero nunca se implementó el plan. The Renault FT AC excels at the stationary tank destroyer role. It offers an interesting selection of guns that can make short work of anything it comes across. Having the chassis of the FT, it is also quite slow and, being heavier, has noticeably worse maneuverability. It also has very limited gun elevation and traverse, and its armor is quite bad, comparable to the Panzerjäger I. The Renault FT AC leads to the Renault UE 57. At first glance, the Renault FT AC does not seem to offer anything that other tank destroyers do. It does not have the fantastic combination of high speed and powerful armament that the T3 HMC has, nor does it have the incredibly powerful guns that the AT-1 has access to. It does not have the speed and mobility that the Panzerjäger I has either. What the FT AC does have is a very interesting selection of guns. There are three 25 mm guns to choose from, each an improved version of the one before. All three use the same ammunition, with the same damage and penetration. None can use HE shells. The 25 mm antichar SA-L mle. 1934 and 25 mm antichar SA-L mle. 1937 are almost identical, with the second gun being slightly more accurate. The 25 mm automatique mle. 1936 is unique to the FT AC, and it is the only tank destroyer with an autocannon in the game. Firing the same ammunition with the same penetration and damage, this autocannon is capable of shredding enemy tanks fooling enough to stay in the FT AC's sights. However, all the 25 mm guns have a significant weakness in the fact that they lose penetration at ranges over 395 m, forcing the FT AC to fight at relatively close ranges. The 47 mm SA-L Mle. 37 offers an excellent combination of good penetration, rate-of-fire, accuracy, aim time, and damage. It can also reliably damage targets at longer distances than the other 25 mm guns. Being based on the Renault FT, the FT AC is not a very fast vehicle, though it turns quite well. Despite this, close combat with other tanks should generally be avoided. The FT has very light armor, and will be destroyed with incredible ease by almost every tank Tier 2 and up. It cannot go toe-to-toe with any of the other Tier 2 tank destroyers. Because of this, the FT AC must be used as a sniper tank and nothing else. Unlike the T18 and AT-1, the FT AC has an excellent view range, which helps it as a sniper. Like on most other tank destroyers with weak armor, Camouflage is absolutely necessary on all crew members and should be prioritized over other skills. Upon reaching 100% on the first skills, dropping the commander's skill for Sixth Sense is highly recommended. Once Camouflage and Sixth Sense have been trained, more specialized skills may be considered. Situational Awareness is useful for the commander (who is also the radio operator), since it helps increase the already good view range. Snap Shot on the gunner (who is also the loader) provides less accuracy bonuses on limited-traverse tank destroyers like the FT AC, but is helpful nonetheless. Smooth Ride is probably the best skill for the driver, since it reduces the accuracy penalty incurred after moving in a straight line. 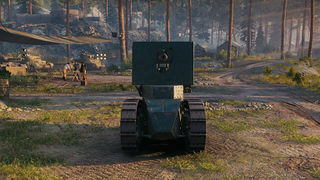 Brothers-in-Arms is a good perk to have on any tank, but requires all crew members to have it at 100% before it works. It should be saved for later on the FT AC, at least until after Camouflage and Sixth Sense have been fully trained. The Renault M26/27 engine and the ER 52 radio carry over from the Renault FT, and should be mounted immediately. The 25 mm antichar mle. 1937 is required to unlock the 47 mm SA-L Mle.37 and the 25 mm automatique mle. 1936. 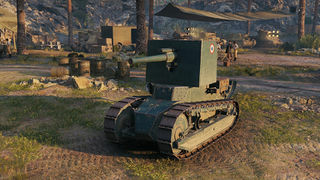 The 47 mm SA-L Mle.37 is required to unlock the Renault UE 57. The Renault FT AC bis suspension is not required to mount modules and equipment, and can be saved for last. The 25 mm automatique mle. 1936 is not necessary for anything, nor does it carry over to other tanks, but it is interesting to use. Immediately after Germany invaded Poland, whole France was in Panic. Years of cutting army budget left France unprepared for the inevitable war. At the time France suffered from chronicle lack of armor. One of the obvious choices was to improve the existing stack of Renault FT tanks, French tanks from the First World War. Although existing in large numbers, FT was the completely obsolete at the beginning of World War II. The original Renault FT 17 tanks were armed with either a 37 mm cannon Puteaux, 18 or 8 mm machine gun Hotchkiss model 1914. Performance cannon SA18 were hopelessly inadequate in anti-tank combat, so French army had the idea to modify the existing vehicles with a modern 47 mm antichar model 1939 anti-tank gun. At the time there was around 1580 FT tanks in service, and as much as 1300 of them in reserve, so the idea of converting obsolete tanks into capable tank destroyer was in a sense logical step considering the situation France was facing. 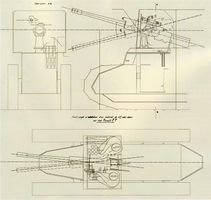 Newly installed gun would have an elevation + / - 15 ° lateral and 6 ° on either side, while crew was to consist of three men. Considering that there was around 300 FT tanks conserved with their armament removed, the plan also included a series of completely new, factory rebuild vehicles. The biggest problem was the speed. While 7,5 km/h while driving off-road was considered enough for World War I infantry support role, it was totally unsuitable for modern combat maneuvering mechanized divisions. Although the idea of conversion was not without grounds, it should have been implemented at least five years earlier. 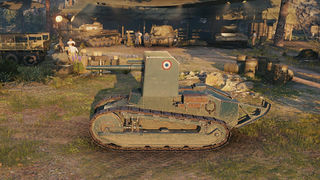 Considering that at the time France had a number of much more promising vehicles in development, like Laffly W 15 TCC, Lorraine 39 chars du Chasseur, or Panhard Tourelle 178 modification of the existing stack of FT tanks was canceled, as it was considered to be waste of already very limited resources. Esta página fue modificada por última vez el 25 oct 2016, a las 13:18.